No Asian team has won a match in this year’s World Cup and Iran were unable to stop that trend due to a last minute goal from Lionel Messi. Iran waltzed out of their previous game against Nigeria with a point coming from a 0-0 draw, arguably from what was a defensive masterclass. Today, their set-up seemed as if they were out to grab another point against one of the favourites, Argentina. At least it started off that way, with Iran only completing 4 passes within the opening few minutes, keeping a compact shape to prevent the South Americans from breaking through. It looked as if the initial game plan was to contain Argentina, restricting them to sending in crosses into the box (which were easily dealt with early on in the game) and long shots, which almost always came to nothing. As the game progressed, Iran slowly started to come out of their shell, but not too much to prevent Argentina from exploiting any space behind the defence. Ashkan Dejagah was the key man in the team, constantly whipping in free-kicks into the box, with one falling to Hosseini who’s headed effort went over the bar. Iran were on the back foot once again when Argentina eventually regained control of the ball and decided to deviate from their plan of launching crosses into the box by being more patient, which culminated into chances from Aguero and Higuain, both forcing Haghighi to pull of magnificent saves to keep the Asian club in the game. 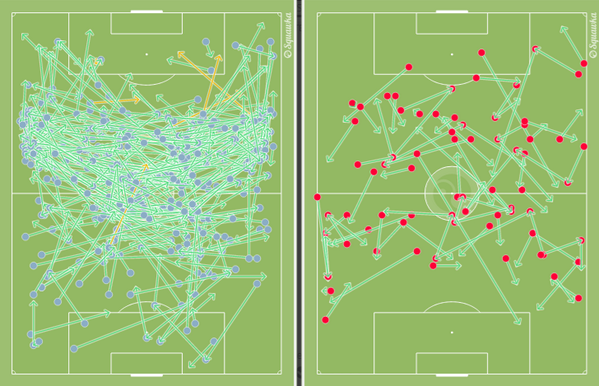 Before the end of the first half, both team’s chances came from aerial balls. Garay and Rojo wasted their chances from corners by heading the ball over the bar from close range. Even at the other end of the field, Dejagah once again finding Hosseini who is unable to direct the ball goal-bound with his head. 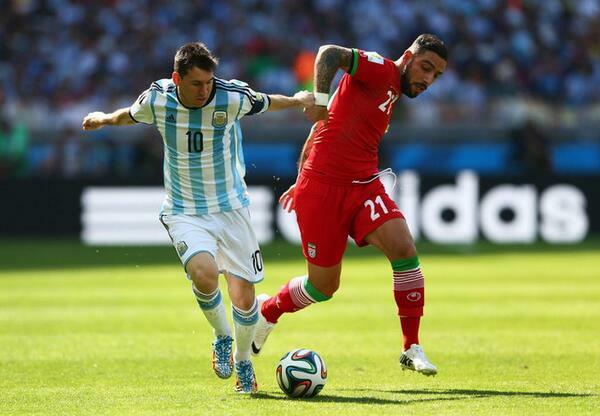 Despite Argentina dominating the first half, Iran had their fair share of chances to go ahead. The second half was more end-to-end than the first half. With Argentina pushing more and more men forward to try and break the deadlock, Iran switched it up by counter-attacking more. One which was lead by Shojaei ended with a cross that found Reza, who was unable to steer it towards goal. As confidence grew and Dejagah becoming even more instrumental as an attacking threat, Iran were denied a penalty claim when Zabaleta brought down the Fulham midfielder in the box with the referee indicating to all players that a foul was not committed. Dejagah continued his annoying streak by out-jumping Zabaleta in order to get on the end of a cross from Shojaei, but was denied by a fantastic save from Romero. Frustration became to creep in for Argentina, who were desperately hitting shots from distance. This almost back fired on them when Iran broke down the left hand side, the ball once again falling in Reza’s possession but the best he could do with it was force a save from Romero. In the midst of all the madness, Ashkan Dejagah was subbed off for Alireza and it may have proved to be their downfall. Lionel Messi, who was terrorised for most of the game by Dejagah, has acres of space and cut inside onto his left foot, curling a scrumptious shot past Haghighi and into the net in injury time. It was a heartbreaking moment for Iran, who only had to hold on for an extra 3 minutes if they wanted to remain unbeaten with two clean sheets in the World Cup this year. Defensively they looked brilliant: any team that is able to nullify Di Maria, Messi, Higuain and Aguero for large portions of the game deserve to win. Perhaps it was a lapse in concentration (as well as a piece of sublime skill from Messi) that led to their downfall in this game. Their last match is against Bosnia and Herzegovina. They will be hoping for the opponents to draw their game against Nigeria if they want to stand a chance at progressing. We may even see a more attacking Iranian side if push comes to shove, but regardless of the situation most of us would love to see them progress, everybody loves an underdog!